Technological disruption and globalisation have created seismic shifts in Singapore's higher education landscape of late. The SkillsFuture push, for one thing, goes far beyond being merely a funding or training scheme. Instead, it functions as an almost philosophical exhortation for society to relook current assumptions and see learning as a personal endeavour. In the face of volatility and uncertainty, the Education Ministry has made concerted moves to shift the focus away from an overemphasis on grades to building aptitude and skills, over the past few years. New programmes that will allow students to work and study for degrees at the same time will be piloted. Last month, the expansion of aptitude-based admissions in polytechnics and local universities was also announced. These changes may have left pragmatic, paper-chasing Singaporeans reeling as they struggle to make sense of it all. 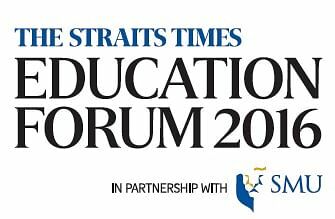 Come next month, 250 people will have a chance to pose questions to Acting Education Minister (Higher Education and Skills) Ong Ye Kung at The Straits Times Education Forum, which focuses on the future of jobs, skills and higher education. The event on June 25, which is in its third year, is organised by ST in partnership with Singapore Management University (SMU). There will be a panel discussion featuring Mr Ong, SMU president Arnoud De Meyer and ST senior education correspondent Sandra Davie, as well as a keynote address by Mr Ong. Places will also be open to ST subscribers, who will be notified by e-mail. These will be given out on a first come, first served basis. Professor De Meyer said SMU is keen to share, learn and exchange new ideas at the forum. "In today's changing economy, we will see career pathways becoming more dynamic and less predictable... What is critical for Singapore's graduates would be to have competencies in various areas," he said. ST deputy editor Ignatius Low, who will moderate the discussion, said the forum will be a great chance to hear directly from Mr Ong about the future of jobs here as Singapore adapts to new economic realities. Said Mr Low: "It is no longer as straightforward as before - to get a degree and a good job, and hope to be set for life in Singapore."